If you want to replace eggs in a dish like a quiche or an omlette, it is actually quite easy. You can just substitute in tofu in most cases. Add some turmeric and the tofu will even get a yellowish egg-like color. Chickpea flour also works great, especially for omlettes and eggless scrambles. When it comes to vegan baking though, replacing eggs can be a bit trickier. Here we will talk about the role of eggs in baking and the best vegan egg alternatives for baking. Eggs Provide Structure: Because eggs harden as they are heated, they hold the ingredients together. Eggs Act As a Leavening Ingredient: This means that they help baked goods rise. Eggs Provide Moisture and Richness: This is because eggs are a liquid and full of fat. Unfortunately, there is not one single vegan egg substitute that can do everything that an egg does in baking. After all, eggs are incredibly complex structures! If you try to veganize an existing recipe by using an egg alternative instead of the egg, the recipe might not come out so well. This is why I prefer to use vegan baking recipes (which have already been tried and tested) instead of trying to veganize existing recipes. However, if you do wish to veganize a recipe, here are some substitutes you can use. A “flegg” is an egg replacer made from flax meal and water. Just mix 1 Tbsp flax meal with 3 Tbsp of hot water and use in place of the egg. Note that you can NOT just throw some flax meal in the batter. You’ve got to mix the flax meal with the water separately! The reason that a flegg works so well is because the outer layer of the flax seed hull is a mucilage, which is a gooey layer found in virtually all plants which aids in food and water storage. When you grind up flax seeds (flax meal) and mix them with water, you get a hydrocolloid – a gel which will bind ingredients together. Fleggs will not trap air like eggs do, so they won’t work well in recipes likes angel food cake or crepes. They also don’t act as a leavening agents, so only use fleggs in recipes which call for vinegar, baking soda and/or baking powder to make the food rise and get fluffy. 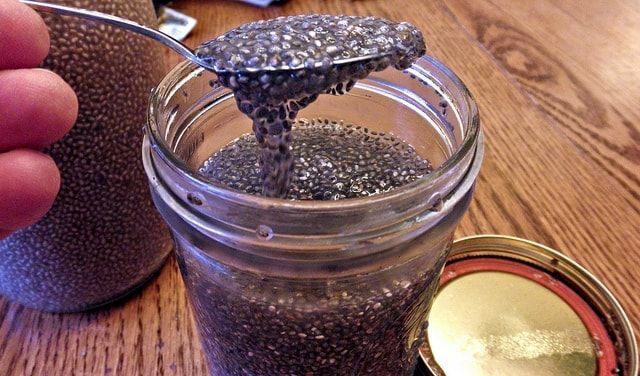 See how chia seeds turn into a gel when you add water! This product has been around for a long time and helped make going vegan easier for a lot of people. There are also a few other brands of vegan egg replacer now too, but I personally haven’t tried them so can’t attest to how well they work. All egg replacer products are made up of a combination of starches and leavening ingredients, so it does a pretty good job of mimicking eggs in baked recipes. The downside of this product is that you may not be able to find it in your local supermarket, but it is one of the best options to use if you want to veganize a fluffy, airy bakery recipe like sponge cake. 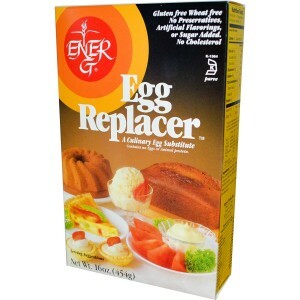 You can even use Ener-G Egg Replacer to make vegan quiche! It costs about $6.86 for 16 ounces. You know how baking soda and vinegar bubble up when you mix them together? Well, this is a perfect way to add some fluffy, airiness to your baked goods without relying on eggs. Mix 1 tsp of baking soda with 1 tsp of white vinegar to replace 1 egg. In a pinch, you can use other types of vinegar (like apple cider vinegar), but then it may add a funny taste to your food! In some recipes, the eggs are only there to add moisture. If this is the case, then you can substitute ¼ cup silken tofu for 1 egg. The tofu not only adds moisture, but it adds protein to the food too! How can you tell if silken tofu will work in place of the egg? As a general rule, if the recipe is dense (like brownies as opposed to cake) AND the recipe already calls for baking soda and baking powder, then tofu will probably work. Remember to puree the silken tofu before you use it or you will get chunks in the finished product! 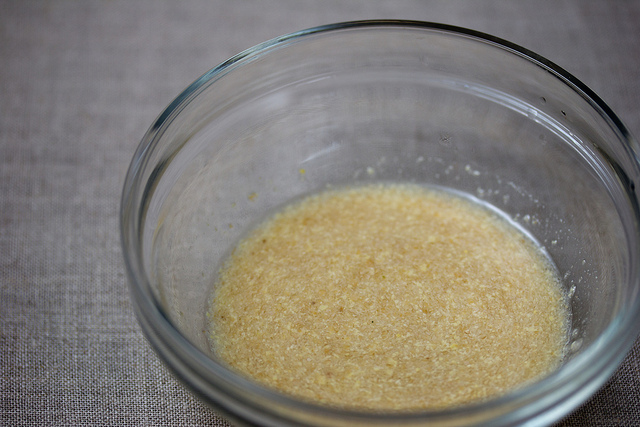 Just like with silken tofu, you can use applesauce or banana in recipes where there is already a leavening agent since the eggs are just there for moisture. Unlike with silken tofu, which is flavorless, these fruit-based egg alternatives add a great flavor to your food. Think banana-walnut pancakes or apple-cinnamon spice cake. Use ¼ cup applesauce or mashed banana for 1 egg. If you are feeling experimental, you can try substituting other types of pureed fruit too. I once even tried vegan cupcakes made with beet puree! This foolproof vegan pancake recipe uses banana instead of egg. Arrowroot powder is a starch, which acts as a binder in recipes for baked goods as well as foods like puddings. Keep in mind that arrowroot won’t leaven baked goods, so you will only want to use it in recipes which already call for baking soda and baking powder. For binding purposes only, use 2 Tbsp arrowroot powder in place of the egg. To bind and get the moisture properties of the egg, mix the arrowroot powder with equal parts water first.